Most duristrictions require either a 1500°F rated gasket tape, or a fire exposure rated gasket tape. DuctSeal™ tapes cover both ratings with one tape. The tape is available in a .090" thickness slit tape, or 1/16" and 1/8" thickness woven tape. Both tape types are available Plain or with PSA (pressure sensitivef adhesive). Tapes can also be held in place during fitting with our high temperatures approved sealant. Sealant can be used to seal the joints of ductwork to prevent grease migration. Also used to adhere tapes to metalwork while fitting access doors into place. Rectangular flat and curved access doors made from Heavy Duty 16 gauge steel. Stainless steel available. 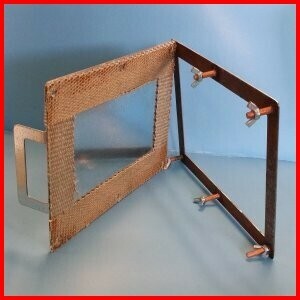 Also available with extended studs to accommodate fire wrap. The back frame reinforces the duct cut-out. Standard and custom sizes available. The gasket is pre-installed and bonded to the front panel.